Following up on my previous post on the topic, I thought I might spend the summer leading up to my last day at my day job exploring in a little more detail why I included each of the articles in my "quit your job" bibliography. I thought surely I'd included Anne-Marie Slaughter's article 'Why Women Still Can't Have It All', which was published in The Atlantic in 2012, a couple of years before I went back to work full-time, almost a year even before my second kid was born (her book, on the other hand, came out a few months after I'd settled into my current gig). I've thought of that article often since January 2015, but I didn't include it in my bibliography because I didn't want it to be perceived as a sort of "women & work" reader. I don't believe the issues I'm been dealing with, supported by the articles that I've included, are necessarily unique to my being a woman or a working mother. I think they're equally, if not at times more tied to dissatisfaction with a daily routine over which I don't feel I have much creative control. And yet, as I settle into this odd liminal period, coming out, so to speak, to people every day that I'm leaving my position at the end of summer, I find myself returning to this tension between career and family that, whether I address it here or not, is undeniably at the core, alongside creative concerns, of why I'm quitting. In short, being a FTWM has been a bit of a drag. 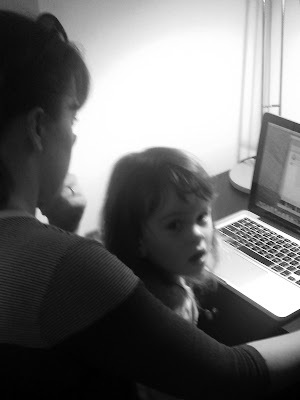 My favorite kind of working mother stock photo! Except this is me and my daughter. After I read the book 'I Don't Know How She Does It', my main question wasn't so much how she does it but why? Granted, I was self-employed with half the kids I have now, and I'm not exactly on par with what a hedge fund manager does (or makes) in my current gig, but at the time and even more so now, after 2 1/2 years of working full-time while juggling family needs alongside my desire/need for more time to be creative, I couldn't understand why she (spoiler alert!) was still at her job at the end of the book. Her daily routine sounded miserable and exhausting; in a word, unsustainable. On the other end of the spectrum, my issue with books like Laura Vanderkam's 'I Know How She Does It: How Successful Women Make the Most of Their Time' is that the onus should not be solely on working mothers to figure out how to "have it all"; the problem is with the systems in place that make the necessary ingredients like decent pay, flexibility, and opportunities for growth and advancement so challenging in the first place (and don't even get me started on the fact that she only interviewed women who make six figure salaries, as if an arbitrary amount of money equals success). Which is not to suggest I think mothers shouldn't work unless they're ready for a life of misery. Most of my mother friends do work and wouldn't have it any other way. They're equally overwhelmed at times, but for the most part they love what they do, they're wonderful parents, and they have items in that elusive third bucket as well, whether it be a creative hobby, exercise, a side gig, volunteering, the occasional date night, etc. But, just because other women do it well or, more importantly, because there are plenty of working mothers who don't have the choice to work less or stay home with their kids (I was raised by one), is no argument for martyring oneself. It's a little like telling your kids to finish their dinner because there are starving children in Africa (do parents still use that line?). American kids finishing their leftovers is hardly going to solve world hunger. Likewise, staying at a job that makes me unhappy won't ever solve the systemic issues that make this math equation virtually impossible to solve in the first place. A couple of years ago, a study made the rounds that reassured working mothers that their kids were going to be just fine. My response to that article, not unlike my response to Allison Pearson's novel was, great, but how are the working moms doing? Ultimately, what I find refreshing in Slaughter's take on all this compared to someone like Vanderkam is that she focuses not on what working mothers are or aren't doing well, or enough of, or too little of, or by defining their success by how much money they make. Rather, she goes to the heart of the problem and addresses the issues that make the "feminist narrative" most easily accessible only to women who "are superhuman, rich, or self-employed." Ultimately, I find less useful the stories of working mothers who've found success in the existing system and a growing interest in changing the system itself to be more equitable and accessible for all women. Finally, with respect to that "feminist narrative," feminism for me is all about choice. You can't tell me I can choose to be what I want, and then tell me my choice is wrong (nor would I do this to any other woman). It's the same defense I explore in my screenplay which is, in part, about the princess culture backlash backlash. But more about that in a later post. I need time, after all, to finish that screenplay, top on my to do list that begins on September 1st.